Shabbychick Junk. 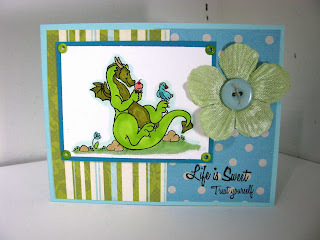 : Our Craft Lounge, Blog Winner & Drake the Dragon! Yippie! I love giving away blog candy! I'll announce the winner right away because, well, I know that's what everyone is WAITING for, right?! 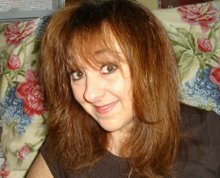 Look at this; Random.org picked a LOW LOW number for this blog candy winner...here it is, lucky number: FIVE! Wendalyn, send your snail mail address to my email account at shabbychickjunk@hotmail.com, and we'll get your Boys Toys set sent out to you! Thanks everyone, for participating! It was fun to see everyone's favorite sets! 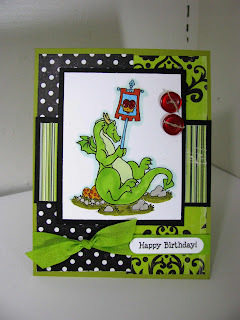 Today I'm posting more OCL samples from CHA; these were done with the newly released "Drake the Dragon" stamp set! This set is a clear set, which is good because there are lots of little fun things that Drake can hold, like a flower, the bird, his sign, etc! Gotta love clear sets when you're masking objects; it makes it easy to see where you're placing it! 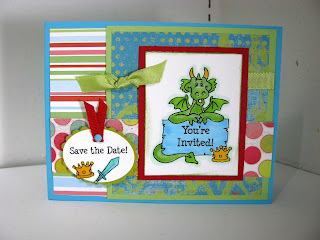 I had to do a sample invitation so that you can see what fun birthday invitations this set makes! Hope everyone is having a good weekend; stop back this week, I'll have new posts every day with new Whippersnapper releases and a Crafty Secrets challenge card tomorrow morning! These Drake cards are so darling!! OMG you are so much fun! I've been looking through your blog and I just love it. I'm in love with vintage as well. Loved all your CHA photos (and especially the GASP one where you almost fainted - LOL). Great job on the dragon.